The phenomenalÂ hostage rescue mission in the jungle around Bogota,Â long planned and perfectly executed by the Colombian military yesterday,Â continues unfolding in the telling of its details. Not all of it is immediately evident, though the above photo comes close to revealing the part of the story not yet covered by major media. This New York Times piece recounts the background and the daring rescue operation thoroughly. CNN has this piece on the Americans who returned home todayÂ to a quiet reunion with their families. one of the most stunning hostage rescues in the history of a country where human abduction is virtually a national pastime. The story colorfully captures the drama and details behind this amazing operation. It’sÂ a compelling account of the revolutionary struggle and the people at the center of it. Among the 15 people liberated was the most high-profile FARC hostage of all, former Colombian presidential candidate Ingrid Betancourt â€” a French-Colombian whose six-year-long captivity had become a cause cÃ©lÃ¨bre in Europe â€” as well as three American defense contractors who had been held for more than five years, one of the longest U.S. hostage ordeals ever. The BBC gives the story, the timeline, and even new video of newly released Ingrid Betancourt’s reunion with her children. There are a few points these stories didn’t quite capture. Neither did the kidnappers. I sawÂ them on CNN’s excellent coverage of the hostageÂ rescue Wednesday evening, watching the group emerge from the helicopter for the first time, the hugs and tears and jubilant faces. The immediate crowd greeting them included Betancourt’s mother, government and military officials, those closely involved.Â After many hugs and kisses, after initial tears were brushed back, Betancourt turned around and made the sign of the cross andÂ closed her eyes momentarily. She did this several times over the next several minutes. When she went before the assembled press microphones for the first time, she spoke of the rescue as ‘God’s miracle’, a reference she repeatedly made. Betancourt said she had started the day that morning praying the rosary, and that the Virgin came to her aid. She spoke of faith, and closed her eyes, face up to the sky, and thanked God. In only one camera angle among all the video airing in this coverage, I saw that among that crowd next to the helicopter to greet the rescued group, a priest in alb and stole was next to Betancourt’s mother. CNN interviewed the Colombian military chief andÂ the USÂ ambassadorÂ in Colombia about the operation, andÂ one of them credited many peopleÂ for working long and hardÂ forÂ freedom for the hostages and peace in the country. They included government, the military, and the Church, he said, and then he continued by giving more details of the military planning. The Church played a role. The ChurchÂ in ColombiaÂ has activelyÂ beenÂ working for peace and justice for…ever….and it was instrumental in this mission, somehow. So was the faith Betancourt embodied. A lot of these articles refer to her disillusionment and depression in captivity. The woman who very shortly after being whisked out of the jungle some six years after being kidnapped and humiliated, spoke with strength and grace and dignity, and credited God for a miracle. Today, when she was reunited with her children, Betancourt wore a rosary around her wrist, and said she prayed it again this morning. Somewhere deep in the middle of one of these news stories, there was a line quoting her as saying that someday, she still hopes to be able to serve her country as president. This ordeal didn’t rob her of the desire she was pursuing when she was kidnapped. That sense of service and active pursuit of justice and peace are strongly informed by her faith. It’s the force more powerful than all the guerillas in the jungle. Whether it’s seen or unseen. I saw it in her televised words and actions since her release. 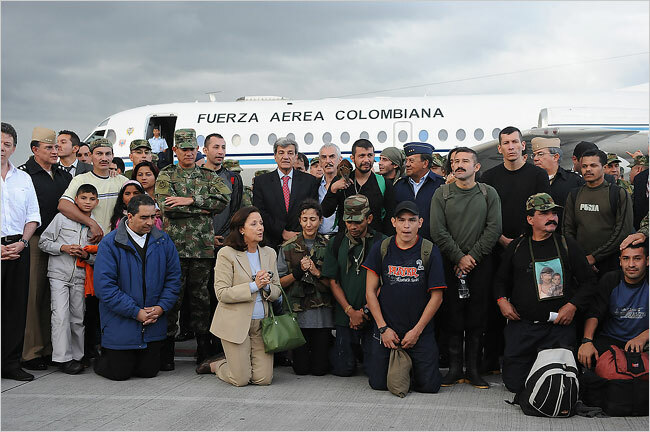 You can see it in the above photo,Â whereÂ in the center, Ingrid Betancourt is kneeling next to her mother, praying. This entry was posted in Geopolitics, Media, Society by Sheila. Bookmark the permalink.